We have been producing "Q type (Q3,Q5)" as nonmagnetic / Corrosion-resistant Tungsten carbide. Requests from many customers made us add new type. 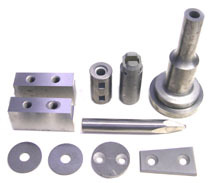 There are applications which require more hardness, toughness and corrosion-resistance. for which we provide new nonmagnetized Tungsten carbide. We are confident that our material can be used in wider range of applications. In picture 1, we indicate simple sample shapes, but we make a lot of special configuration, actualy. Compare with another nonmagnetic/corrosion-resistant tungsten carbide, Q2 can make sharp edge, and good at blades. It has superior physical property such as high hardness, high transverse rupture strength as well as high corrosion resistance.